The story of Ferdinand, the pacifist, flower-smelling bull, has long-captured the hearts and imaginations of readers worldwide. 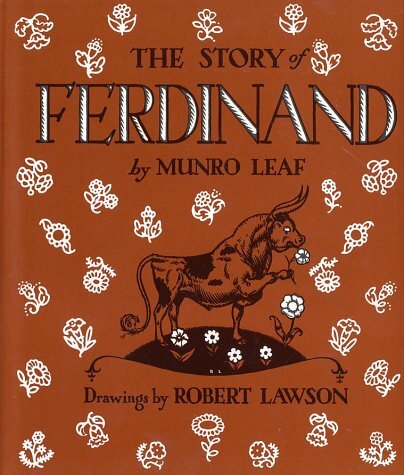 First published in 1936 by Munro Leaf, Ferdinand tells the tale of the titular hero, a kind, daydreamy sort of bull who would much prefer spending his days among the flowers of the hillside than snorting and roughhousing with the rest of the herd. And while the other bulls aspire to meet their fate in the bullrings of Spain, sweet Ferdinand opts for a gentler existence with his thoughts and his flowers. That is, until, a bee makes its way into Ferdinand’s repose and causes the otherwise peaceful bull to become agitated and wild. It is in the state of typical bull behavior that Ferdinand is seen by the bullring officials and is mistakenly taken in to the ring for a fight. Ferdinand’s true colors come back in the ring, however, and this adorable bull finds solace in the flowers in the senoritas’ hair. This book is one of those classic tales that never really leaves you. I first read it as a child and I still find myself thinking of the reluctant toro and the lessons it taught me and continues to teach children today. Automatically selects all options in this row.